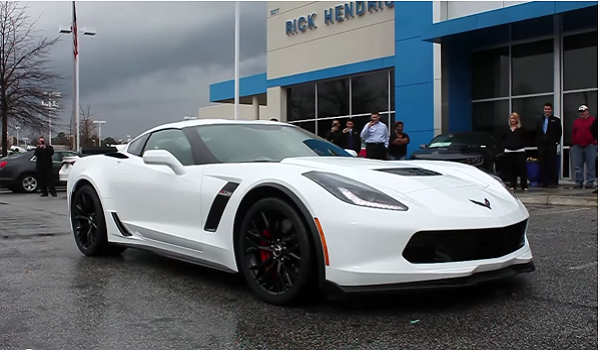 The all new 2015 Corvette Z06 is among the baddest and fastest Corvette that Chevrolet has ever produced and Vengeance Racing has decided to take the car to the next level with the massive burnout right outside the dealership to showcase the strength of the vehicle. This is not just to show the strength of the vehicle, but also to display the performance of the 335/25ZR20 sized Michelin Pilot Super Sport 2 tires that come with the vehicle. The never ending burnout test produces enough smoke to engulf the car in it. Vengeance Racing is a full blown race shop that specializes in General Motors’ vehicles and the shop would have taken care of the new Corvette Z06 that they just bought. It is predicted that the car will soon be on the streets with some custom accessories and parts that will take full advantage of the 6.2 liter V8 engine that produces 650 horsepower and 650 lb feet of torque.